The Shri Bhairav or the Bhairavnath Yantra is believed to be one of the most powerful of the Hindu Yantras. Bhairava as been repeatedly mentioned in many previous posts symbolizes the inevitable time, which even the high and mighty dread. It is also one of the ultimate realities and fundamental truths, which govern even the Gods. Thus, a Yantra symbolizing Bhairava is extremely potent, powerful and effective. In this post, I have explained how to prepare and use a Bhairav Yantra. The Bhairav Yantra, like the one shown in the image should be drawn on a Bhojpatra with Ashtagandha Past using a pointed stick as the pen. Then it should be worshipped by offering it Guggul Dhoop [Indian Bdellium] and kept of the body. The Yantra can be inserted in a Locket or Tabeez or kept in the purse or wallet, like a lucky and protective talisman. The practitioner can also use any other procedure along with the basic procedure explained above to energize the Yantra, as per his desires, if he is engaged in any other kind of Bhairav Yantra, Mantra or Tantra Sadhana. The Bhairav Yantra meets all the requisite material needs like money and wealth and has protective properties like protection from ghosts and spirits, black magic, voodoo and occult spells. Jadu-Tona and mystic unseen and paranormal energies. There are quite a few Bhairav, Batuk Bhairav and Maha Kaal Bhairav Yantras available in the market. The one described in this article is very simple to prepare and yet it gives all the immense benefits of the other more complicated Bhairav Yantras. 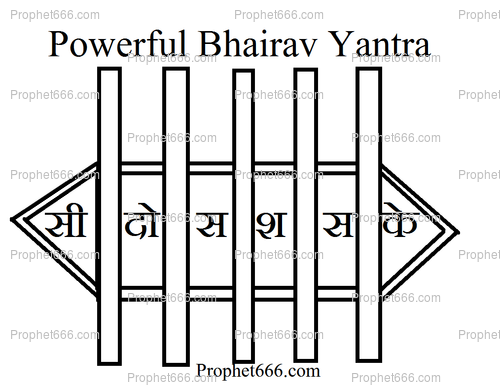 Any specific mantra to chant for shri bhirav yantra. I have not prescribed any specific Bhairav Mantra, if you wish you can chant and of your desired Mantras of Bhairava. If you want to make the Yantra on white paper then use red color ink. Can we laminate yantra and put it in wallet once pooja done. Sure, you can laminate this Bhairav Yantra and keep it in your wallet, pocket or purse. Yes, to both your questions, you can put the Yantra in the Puja-Ghar and worship it and it is as mentioned in the article said give give complete protection from evil and negative energies. Can we make this Yantra on any day and any time? Yes, you can make the Yantra at any time or day. Sir a lunar eclipse is going to happen today or tomorrow. Please specify its date and time details.Hope this great information will help a lot of people including me too. Please reply as soon as possible. The period of the Chandra Grahan will be between 6.37 am till 9.57am on Monday, which is 28th September 2015 in most parts of India. However, check your local Panchang for any variation in the time zones. Once the yantra is prepared how long we can use it . I.e when we should replace and make new yantra. This Bhairav Yantra can be used as long as you like, if it get damaged, you should immerse it in a flowing water body and prepare a new Yantra for which the same procedure given in the article is applicable. Sir Please specify the bhairav beej and the bhairav beej mantra also. BHRAM or भ्रं is the Beej of Bhairav, it is also chanted as a Beej Mantra. 1. Sir can I chant the following mantra as a beej mantra of Great lord Shri Maha-Kaal-Bhairav. 3. how to charge the yantra for best result. 1. It would be best if you use black or red thread for wearing the yantra tabiz. 2. A new-moon night or the 8th day of the dark fortnight of any Indian lunar calendar is perfect for doing this yantra experiment and wearing it on your body on the same day after doing the requisite puja or ritual i.e. mentioned n the post. 3. Can use any favorite Bhairav mantra to make it more potent. If possible try to chant 108 times or 10x108 times daily with black hakeek or rudrakshya rossary. You can find many mantras dedicated to Bhairavnaath on this site. In case if we didn't found bhojapatra, astaganda googal dhoop what we can do in subtitute. Can we write yantra with saffron in in white blank paper and wear in silver locket along with chain. In case all the prescribed Samagri in unavailable, then as explained in a reply to another comment you can write the Yantra on white paper with red colored ink. Can I prepare it during Holi? Sir myself, my husband and my two daughters are suffering since 15years from black magic problem even though we are healing our selves with Rekhi healing but entities through black magic always attacking us through my husband's office colleagues and nebhours so please save from this effect as fast possible.